Green Lantern had a tough time in the 90s. Hal Jordan, of the classic Silver Age era, went evil during the Death of Superman and Zero Hour events. Johns himself did try to redeem Hal as his ghost became the new Spectre in the Day of Judgment crossover. It really changed in Green Lantern: Rebirth, which brought Hal back to life and returned the Green Lantern Corps to prominence. Kyle Rayner, the 90s-era replacement, even got to stick around. It was a bit convoluted with the revelation that the Parallax fear energy being had possessed Hal Jordan and caused him to turn evil. Now he was back without even the grey in his hair. Personally, I always liked the corps and the outer space opera of Green Lantern, although I was apprehensive at first at the return of the status quo. What was really cool – and most obvious in retrospect – was the new villainous force of the yellow Sinestro Corps. That blew up into even more with colors, and more on that shortly. By the mid-2000s, Geoff Johns was now firmly in place as the leader of the DC. Infinite Crisis was his next major crossover, focusing on the challenges of DC’s core trinity: Superman, Batman, and Wonder Woman. He referenced Crisis on Infinite Earths and brought back the original Superman of Earth 2. It was a continuity-heavy, I’ll admit. After Infinite Crisis, DC did a time-skip in which all titles jumped to a year in the future. Some of these were more successful than others, but it was an interesting method to get new readers and have a fresh start. Geoff Johns wrote more than a few Superman titles at the center of it. Most interesting of all was 52, the world’s first “real time comic” with every issue of the one-year-long series taking place in one week within the gap year. Cowritten by Grant Morrison and Mark Waid (also Greg Rucka whom I don’t mostly care for but was more of a Batman-side DC writer, and his Wonder Woman run was okay too), ’twas some top-notch writing. The premise was the trinity was gone all year and it was up to Booster Gold and Question and other lesser heroes to save the day! The year was 2008. Final Crisis was the scheduled annual event, headed by Grant Morrison. I read, I read. And later that autumn I was to move from California to Shenzhen, China. One of the biggest challenges to moving abroad was how to deal with my comics hobby. I already mailed my entire collection coast-to-coast more than once. Not worth it internationally so; and today most of these comics are in some family closet gathering dust. I am glad I moved to China and turned my life around, but that was honestly the hardest part. What can I say. 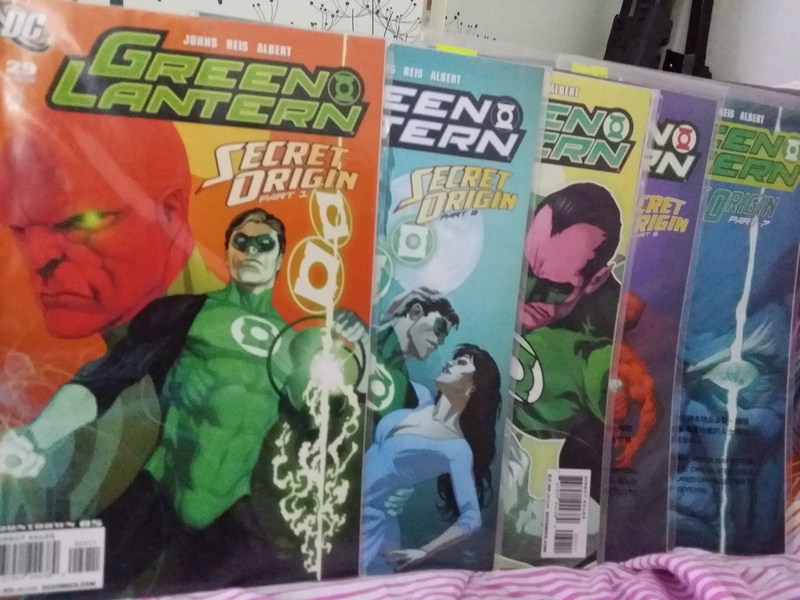 I was determined to keep up with reading Green Lantern. Not to mention others such as Grant Morrison’s Batman, One Piece and Naruto in the manga world, and Gail Simone’s Secret Six which I will get into next post. I did bring a few trades to reread. But I needed more. Asking relatives to mail me comics wasn’t really working. Luckily, I live in Shenzhen which borders Hong Kong — the former British colony still a very Westernized city. There’re the Page One bookstores which have decent graphic novel selections. And, I discovered Hong Kong has not one but two English-language comic shops! I made the trek past the border twice a month for a while there, making friends with my comic guy and reserving all my favorite titles. Do check out Clark’s Comics if you’re ever in the Causeway Bay area. So my comics habit had continued unabated. It was 2009, and Geoff Johns was ready to let Barry Allen follow in Hal Jordan’s footsteps and come back to life in the pages of Flash: Rebirth. And then. Finally. At the cusp of a new decade, deep into the 21st century, came the pinnacle of all that Geoff Johns had been working towards all these years. 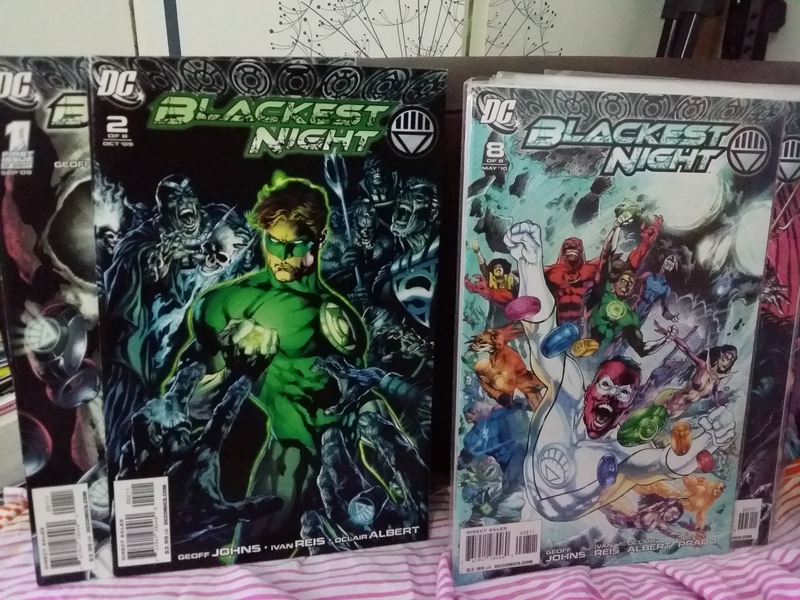 Green Lantern had been leading up to Blackest Night the entire time. It had turned out that there was a whole spectrum of different colored corps, each corresponding to an emotion.Green represented willpower, and the yellow light of Sinestro was fear, etc. There was blue for hope, indigo for compassion, and more. It was growing into a very broad mythology. Most evil of all were the Black Lanterns, who were basically undead zombies. In trying gain an emotional reactions for the purposes of sucking energy from their victims, corpses rose from the dead from all over the DCU. It was enticing storytelling, epic in scope, incorporating the theme of superhero resurrections in a terribly valid way. Hal Jordan and Barry Allen, back to life, fighting together again against the forces of death. 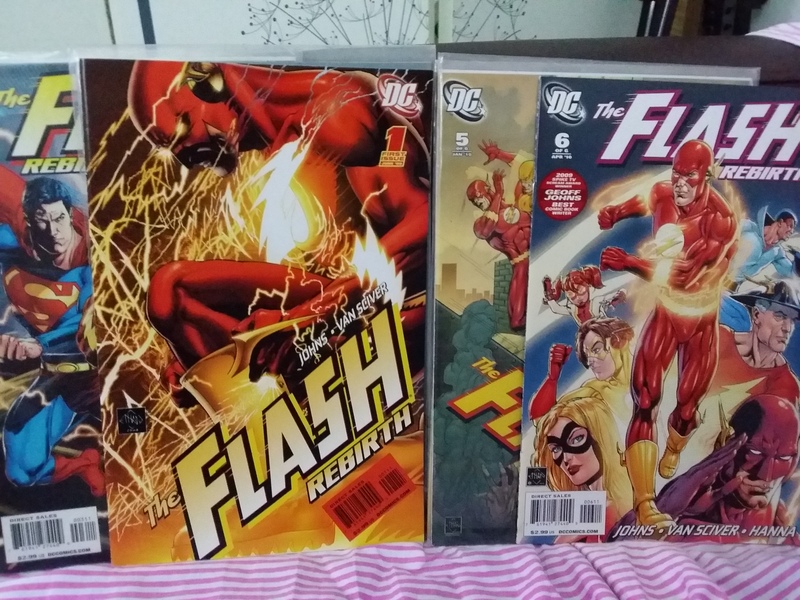 It was so much fun going to my HK comic shop to find each tie-in issue and read them as soon as I could. That’s the thing about comics, as much as graphic novels are more literary, it’s the most fun to read the stories right as they’re published and get that sense of cliffhanging urgency. Of course, the good guys won in the end, but just barely. 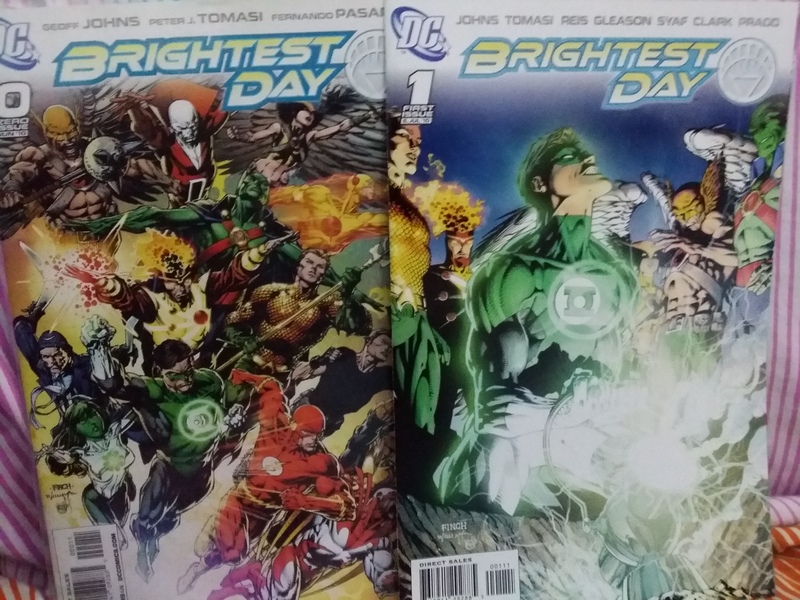 The status quo had been unraveled, and next was the Brightest Day biweekly series. I ate that stuff up over the next year, still fully a DC fan though an expat transplanted in faroff Asia. Sadly, this pace could not go on unabated. DC ran out of steam eventually, and they had to reboot it all. Flashpoint was about grimmy alternate realities or something. After the fact I got the graphic novel, but no tie-ins. Not my favorite, not my kind of thing. The new universe was called the New 52, and everything had started over. Sure Action Comics and Batman Inc were worth checking out (re: the Grant Morrison pattern therein). But I only followed up on Green Lantern online. Justice League by Geoff Johns and Jim Lee was to be the core DC book, and yet it wasn’t for me. The whole thing felt like it was trying to be an action movie now, not a quality TV show. No sense of history or continuity. I suppose my ilk of comics fan was never meant to last forever, and it’s more important to gain new readers. Ah well. I don’t buy comics as they come out anymore. I buy the trade reprints months or years later, if at all. Something like the Forever Evil crossover is only worth skimming at a bookstore. I’m just not that invested anymore. For a while there though, DC was it and Geoff Johns was the very center. For now, I will keep and cherish my lovely memories of the magic that was the DC Universe. I’m almost done here, and it comes to mind that Mark Waid deserves a post all his own. Yet I can only fit so much, and I’ve already mostly gone his authorship over in the DC 90s and Superman post (and later I’ll get into his Fantastic Four run in my future Marvel 2000s). Also, I was a big fan of Legion of Superheroes and there’s that. So let me get into the Legion for a bit. In the Silver Age, Superboy was a member of a 30th century team of super teens. In the 80s, writer Paul Levitz built up a fond science fiction mythology upon the esteemed heroes of the United Planets. Founders Cosmic Boy, Lightening Lad, and Saturn Girl joined by Chameleon Boy, Braniac 5, Blok, Ultra Boy, Star Boy, Triplicate Girl, Wildfire, Phantom Girl, Invisible Boy, Shrinking Violet, and so many many more. It was colorful times. I got into it a bit later though, when Mark Wait created the reboot after Zero Hour in the 90s. Starting from scratch, it was perfect for me. Late in the game, I tracked down every single issue at conventions and back issue bins. In an era of gritty dystopias, it was a positive future to look forward to. I always liked outer space and time travel meself. They also had the coolest futuristic villains. There was a ‘threeboot’ in the 2000s also written by Mark Waid. 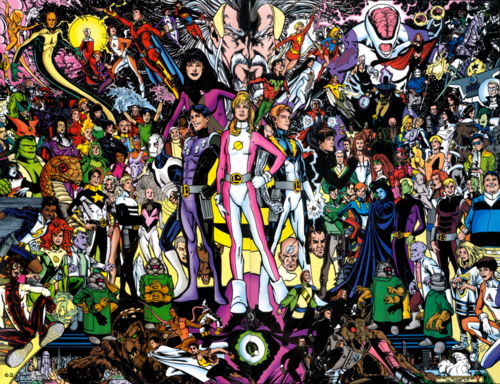 Later still, Geoff Johns brought back the classic pre-Crisis Legion, and wrote the Final Crisis: Legion of 3 Worlds to streamline the whole thing and give a dignified finale to Waid’s era(s). Geoff Johns. Grant Morrison. Mark Waid. Those are a lot of white male authors I enjoy. Nothing wrong with that, but perhaps there should be more diversity in comics. It’s been said that the American industry has always been too much of a boy’s club, and perhaps that is a legitimate criticism. Don’t fret. One of favorite authors is indeed of the female persuasion, and writes as badass as anyone. Birds of Prey and the Secret Six. This entry was posted in Comics and tagged 52, Avengers, Barry Allen, batman, Blackest Night, Booster Gold, Captain America, China, comics, DC, Final Crisis, flash, Geoff Johns, grant morrison, green lantern, Hal Jordan, Hawkman, hong kong, Infinite Crisis, James Robinson, JSA, Justice Society, Legion, Legion of Super-heroes, Mark Waid, marvel, Paul Levitz, Robin, Rogue's Gallery, Suberboy, superhero, Teen Titans, Wally West, Wonder Woman by Ray. Bookmark the permalink. Looking forward to your Gail Simone post. I don’t blame you for reading trades over single issues. Many readers do that these days. Glad to hear that you can still buy stuff thanks for Hong Kong. It’s also possible to read digital comics, although I understand that’s not an option everyone likes.